Weihai Torch High-tech Industrial Development Zone Hengde Vocational Training School is a formal vocational training school approved by Weihai High-level Labor and Personnel Bureau. The school is located in the beautiful coastal city of Weihai, with Shandong University Weihai Branch, Harbin Institute of Technology, and International Bathing Beach. Adjacent, convenient transportation and pleasant learning environment. The school has a construction area of more than 4,000 square meters, complete school facilities, strong teaching staff, regular management of the school, and a complete teaching management system, which provides convenient conditions for the students' study and life. The school adheres to the tenet of “Perseverance, Virtue and World” and follows the philosophy of “Serving the Society and Achieving the Future” to teach and educate people. 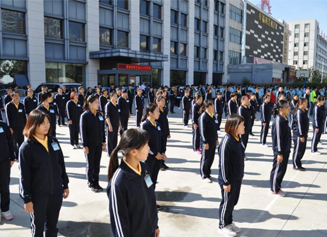 The school is oriented to the society, with vocational training as the mainstay. It offers different professional training courses according to the needs of social employment in different periods, mainly including chefs, pastry chefs, ramen and other skills training. The school has also established a sister school with a number of universities including South Korea, Japan, and the United States. It has signed an agreement with more than 20 schools to provide language training courses for foreign students in different countries, including Korean and Japanese. English, etc., lay a good foundation for students to study abroad. After years of practice, the school has accumulated rich management and teaching experience, and has extensively absorbed the needs of trainers in the society. Through conscientious and unremitting efforts, more students can learn and achieve better quality with first-class quality. Good service to society. 위해화거고기술산업개발구 항덕직업교육학교는 위해시 고구 노동인사국이 허가해주는 정규적인 직업학교이다. 저희 학교는 아름다운 해안 도시 위해에 위치하고 있다. 하얼빈공업 대학교와 국제 해수육장이 인근에 분포하고 있어 좋은 학습환경과 편리한 교통조건을 잦추고 있다. 4000m²의 넓은 면적을 사용하고 있으며 학교가 시설이 완비하고 교사 실력도 좋다. 완전한 교수관리시스템을 잦추고 있으니 정규한 관리를 실행하며 학생들을 위해서 좋은 교수환경을 제공한다. 저희 학교는 “오랫동안 견지하고 덕행으로 일한다”는 목적으로, “사회를 봉사하고 미래를 이루하기”의 이념에 따라서 지식을 전달하고 인성을 육성한다. 학교는 사회를 향하여, 직업교육을 주된 것으로 여기고 다른 시기에 사회 취업의 수요를 따라서 양성반을 설립한다. 주로 요리사, 면식사, 수타사등 여러가지 기능 교육을 안배한다. 그리고 한국, 일본, 미국에 있는 많은 대학교와 연합해서 우호적인 자매관계를 맺었다. 따라서 20여개 학교와 유학생을 파견하는 합의서를 채결했다. 유학생들은 외국에 나가서 좋은 기초를 만들려고 전문 언어 양성반을 개설하여 주로 한국어, 일어, 영어 등 외국어 교육을 시킨다. 오랫 동안 실천을 통해서 학교는 풍부한 관리경험과 교수경험을 쌓았다. 마음이 넓음을 이르고 광범하게 교육을 받아야 되는 학생들을 접수 받으며, 일류의 품질로 사회를 봉사하고 학생들이 성공하도록 열심히 하겠다.